Make no mistake about it: of the planet’s 212 countries and the 193 members of the United Nations, all but a few would want to host the president of the most economically, financially, scientifically, technologically, educationally, and militarily powerful nation. Peoples of this region include large numbers that have longed for this kind of American leadership for quite some time. Americans have long been mistakenly accustomed to thinking that the largest number of U.S. armed forces abroad are in Germany, Japan, and South Korea. For some time, however, this has no longer been true – they are stationed in the GCC. Thus, the additional significance of the visit to the Kingdom’s capital, which is also the GCC’s headquarters. Mr. Trump’s meetings with these influential additional leaders in a matter of days ought not to be lost on anyone. Coming at this time, the President’s visit sends a strong message of American engagement, projection, and commitment to the internationally concerted, U.S.-led action against violent extremism. The visit conveys a much welcomed determination for the United States to join with GCC and other Arab and Islamic country efforts to push back against Iran’s interference in Iraq, Lebanon, Libya, Syria, and Yemen. In fact, GCC foreign ministers recently met in Riyadh to discuss the visit. They convened with a view to placing their countries’ relations with the United States on a firmer foundation than what they came to be in the last year of the Obama administration. Foreign Ministers from the Gulf Cooperation Council countries meet in preparation for the upcoming GCC-U.S. and Arab-Islamic-U.S. summits in Riyadh, Saudi Arabia, on May 17, 2017. Photo: Gulf Cooperation Council. A public statement released by GCC Secretary General Dr. Abdul Latif bin Rashid Al Zayani noted that the foreign ministers would “explore the on-going preparations for the consultative meeting of the GCC leaders, scheduled for Riyadh, in addition to the U.S.-GCC Summit and Arab-Islamic-U.S. Summit to be held in Riyadh on Sunday during the upcoming visit of U.S. President Donald Trump to the Kingdom.” H.E. Dr. Al Zayani added that the GCC’s foreign ministers would also discuss the latest regional and international developments, together with how best to enhance their, America’s, and other countries’ global efforts against radical militancy. The overall goal of the upcoming meetings in Riyadh will be to further advance the special strategic partnership between the United States and the Kingdom. Both sides acknowledge that specific areas in need of heightened ties include defense and security as well as trade, investment, and economic cooperation. A Saudi Arabian goal of immense importance is to obtain an official American endorsement as well as practical support for “Vision 2030,” the country’s massive economic transformation plan. In addition, the President will meet on Sunday with GCC leaders and the representatives of 55 Muslim majority countries. For the significance of such an event one need look no further than to recognize that no meeting quite like this one has occurred before. On one hand, an objective for this part of the visit will be to seek these nations’ assistance against the threats posed by radical extremists and Iranian interference. On the other, it will be to help bring an end to the bloodshed currently occurring in five of the Arab world’s 22 countries. A New Regional Security Architecture? Little known to many is that Saudi Arabia bears one of the highest defense burdens in the world. The International Institute of Strategic Studies noted that the Kingdom’s military spending accounted for 12.7% of its GDP in 2015 and 8.9% in 2016, ranking it fourth behind the United States, China, and Russia. Even so, and despite the global decrease in the price of oil, Riyadh remains one of the largest consumers of American Foreign Military Sales (FMS). Furthering this side of the relationship, President Trump is expected to arrive with an additional $100 billion in FMS packages that include ships, missile defense, and maritime security systems. The significance of the President achieving a commercial deal of this size would not be lost on defense strategists and analysts. It would represent a significant reversal of the White House’s stance near the end of the Obama administration. What other meaning should one read into this component of the President’s visit? For starters, Mr. Trump’s time in Riyadh would signal U.S. administration agreement that Saudi Arabia is critical to countering Iran’s efforts to undermine regimes friendly to the United States. Straightening the military relationship between Washington and Riyadh would further align American and coalition countries in their joint quest to defeat ISIS, al-Qaeda, and other violent extremist groups. As much as if not more than anything else, the President’s visit is significant because it should help to focus everyone’s attention on an important challenge: for the participants to jointly commit to a future objective, often overlooked, that has vital implications for all concerned. This would be the summiteers’ collective vow to ensure that what must come after ongoing operations is a significantly reduced chance and capacity for violent militants to threaten these key American allies, or any other nations, again. Saudi Arabia’s Crown Prince and Minister of Interior HRH Prince Mohammad bin Nayef chairs a joint meeting of Gulf Cooperation Council Interior, Foreign, and Defense Ministers Joint Meeting in Riyadh, Saudi Arabia, on April 27, 2017. Photo: Saudi Press Agency. To these and related ends, speculation – long bantered about by Americans and others who would hope to become financial beneficiaries – has it that the United States may encourage a GCC-centric Arab “NATO” arrangement. The strategic military goal of such an undertaking, which would be to further ensure regional security and peace, is unassailable. Without these two realities – security and peace – in place and maintained over time, there can be no prospects for sustained stability, modernization, and development. Standing in the way of such an achievement, however, are decades-old geo-political obstacles anchored deeply in pan-Arab sentiments that have repeatedly weighed in against such an arrangement being forged. None should doubt for a moment the complexities entailed in being able to reach such an accord. Neither should one try to gloss over the kinds of difficulties that could be expected were it achieved. These thoughts are penned from the Arab State of Qatar, situated smack in the middle of the western side of the Gulf and directly across from Iran. The past few days have provided opportunities for this author to speak about the President’s visit with high-ranking Qatari officials and those upon whom they rely for advice and recommendations. All are mindful and in varying ways proud that Qatar hosts the United States Central Command’s forward deployed military presence. All are also aware and appreciative of the fact that the Command’s official Area of Responsibility includes all six GCC countries, Iran, Iraq, Yemen, Egypt, Syria, Jordan, Afghanistan, Pakistan, and beyond. What stands out most, however, is that almost all, too, have for some time longed for a more robust American defense and other leadership role in this part of the world. This is but indicative of the hopes that many in this region have for the success of the President’s eminent visit. A retired Qatari petroleum executive, who was not authorized to speak for the record and who spoke to me privately, echoed the sentiments of numerous others. Another topic that will be discussed by President Trump and his Saudi Arabian hosts is how and what the implications are of the Kingdom’s economy undergoing such immense and far-reaching change. The transformation is being guided by Deputy Crown Prince Mohammed Bin Salman and other officials. Released 13 months ago, Saudi Arabia’s “Vision 2030” represents a massive shift away from dependence on a commodity closely tied to the shifts of external markets. Coupled with 70% of its population under the age of 30 years old, Saudi Arabia in this regard and in numerous other ways has started planning for the future in an unprecedented manner. Never before has this writer seen anything as bold, sweeping, and visionary as what the Kingdom is trying to achieve. For background and context, in 1950 the Kingdom had a population of 3.9 million people. The number of inhabitants now is nearly 30 million. Diversification, privatization, replacing foreign workers with nationals, and improving incomes and living standards for the country’s citizens are among the parts of the newly minted comprehensive plan. There is no question that the transformation plan represents an unprecedented opening for companies. U.S. manufacturers, retailers, and service providers stand to benefit substantially. These and other important private sector actors are looking for talent in places they have never looked before. Those doing so envision potential gains from employing a workforce with a high proportion of graduates from American institutions of higher learning. According to an unofficial study by a former nationally-prominent deputy minister, such graduates exceed 300,000. If accurate, this has to be one of the largest number of U.S.-educated and trained university, Saudi Aramco, and a wide variety of technical school graduates living and working in one country anywhere in the world. The opportunities from this perspective alone – and the chance to build upon them – are numerous and staggering in scope. These Saudi Arabians constitute not only a massive U.S.-produced human resource base – they include tens of thousands who are unabashedly nostalgic about their time in the United States. Untold thousands of the Kingdom’s citizens are highly vocal about their almost unadulterated fondness for the American people. Their emotions are rooted deep in the times and kinds of teachers, foreign student advisers, and others with whom they met and spent such quality time with when they were transitioning from their post-secondary school studies to adulthood. Not far back, more than 100,000 of these Saudi Arabians had reportedly purchased residences in places all over America. Impressive numbers of these individuals have done so with a view to locating as near as possible to where they had gone to school before. For decades they have been bringing their spouses and children with them to America. Together, they have basked in a country and with a people dear to their heart. Not one among them is embarrassed to admit with a pride that is often something greater than many an American tends to admit. This is that during what were the most impressionable years of their earlier preparatory life, the United States, as a country and a people, made an indelible and lasting impression upon them. Indeed, America was the place away from home whose people, in what at first was a strange and foreign land, they had most come to love and not on their life would they ever forget. U.S. Secretary of State Rex Tillerson and Saudi Arabia’s Foreign Minister Adel Al-Jubeir address reporters at the U.S. Department of State in Washington, D.C., on March 23, 2017. Photo: U.S. Department of State. This writer has said it often before. Each day since the late 1970s has been witness to a phenomenon likely experienced in few other countries. For nearly forty years, a greater number of American university graduates from Saudi Arabia with advanced degrees have served in their country’s Cabinet, or Council of Ministers, than there have been officials serving in the U.S. Cabinet with advanced degrees from anywhere. Figures pertaining to the 150 Members of the Kingdom’s Majlis Al-Shura (Consultative Council), the nearest deliberative body to the American Congress, are as astounding if not more so. Perhaps 90% have their doctoral degrees from universities in the United States. In dramatic contrast, the number of Congressmen with graduate degrees from anywhere is massively fewer. To be sure, no country’s leaders who seek to make life better for their citizens are devoid of defect. Mistakes are made by people who are active and try to improve things; those whose errors are few or none tend to create little or nothing of value that impacts the lives of others. This said, few could readily find fault for the Kingdom approaching its challenges in an innovative spirit. Saudi Arabians constitute not only a massive U.S.-produced human resource base – they include tens of thousands who are unabashedly nostalgic about their time in the United States. But one example among many others is that U.S.-trained and educated Saudi Arabians citizens who are still in the United States are being encouraged to participate in internships with American companies before returning home. Indeed, a Center for Career Development exists at the Saudi Arabian Cultural Mission in Washington. The Center interacts and liaises with U.S. companies already conducting or looking to do business in the Kingdom. Each side recognizes the value of such opportunities. Growing numbers are eager to reap the advantages and leverages that abound in both directions. Not least among the mutual advantages and potential material gain is that there is no obligation to the other by either of the parties. The host corporation doesn’t have to offer further employment or the intern to accept it, if offered. U.S.-trained and educated Saudi Arabians citizens who are still in the United States are being encouraged to participate in internships with American companies before returning home. The students are already in the United States. They are vouchsafed for by the Saudi Arabian Embassy. The intra-U.S. travel cost per intern is minimal. And there are no undue complications in the process of extending the students’ visas, in cases where this might be necessary. Opportunities abound for U.S.-Saudi Arabian partnership and engagement, and effective utilization of the Kingdom’s human resources is an important aspect of the changes underway. Saudi Arabia is seeking over $200 billion through the privatization of its energy, health, education, agriculture, mining, and numerous other sectors. In addition, five percent of Saudi Aramco – the world’s wealthiest company worth more than a trillion dollars – will be sold through the Kingdom’s and select foreign stock markets. Proceeds are destined for Saudi Arabia’s Public Investment Fund, slated to amass the world’s largest sovereign wealth holdings. The funds expected from the sales will not lie idle long. The forecast is that a large portion of the anticipated revenue is certain to increase the Kingdom’s already massive investments in the United States. A gas flame is seen in the desert near the Khurais oilfield in Saudi Arabia. Photo: REUTERS/Ali Jarekji. Such are among the achievements and statements of intent that President Trump’s team anticipates being able to announce during the upcoming visit. A growing American urge to invest in the Kingdom – and vice versa – is therefore obvious. The interest is marked by U.S. financial firms rapidly moving to establish a foothold in the country. The confidence of business representatives on both sides is buoyed by awareness that Saudi Arabia continues to produce nearly one third of all OPEC member-country oil currently exported to global markets. All of this is in keeping with Mr. Trump’s wanting to promote his “American First” ideology. But one among other paths towards doing so would be for him to find ways to incentivize the Kingdom to increase substantially the extent of its U.S. monetary assets in the United States. A perennially profitable set of holdings are U.S. Treasury instruments, heightened to seek greater levels of purchases, deposits in U.S. banks, and investments in American financial markets. 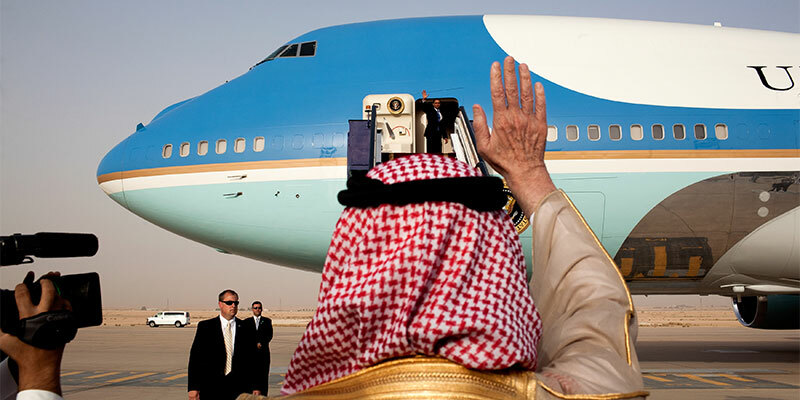 In historical terms, President Trump’s visit represents an opportunity not quite on a par with President Roosevelt’s unprecedented, prodigious, and far-reaching meeting with King Salman’s father in February 1945. This said, its potential significance appears to be tilted in that direction. Certainly, there is no question that there has been nothing like that meeting at Great Bitter Lake since. Instead, far from the atmosphere of President Roosevelt’s meeting with modern Arabia’s and the Gulf’s most powerful and influential monarch, what one has in this instance is something profoundly and categorically different. This moment finds a President in domestic trouble but on the threshold of what, barring a serious mishap, could be one of the more phenomenal moments in contemporary U.S.-Arab relations.